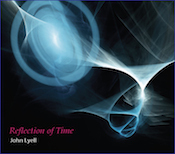 Dear Spacemusic Fans: If you have not already familiarized yourself with John Lyell, please do so immediately. His music falls in a perfect space between classic glimmer-of-stars drifts and Quiet Music-style ambient hush. His signature chime tones are round and soft and calming, gentle pings against ethereal washes, like Eno’s Thursday Afternoon set adrift in the cosmos. Reflection of Time is his latest excursion and it continues an excellent line of releases. Before Lyell goes full space on us, he opens the disc with robotic rhythms on bass keys underscoring pads on “The Deep Unknown.” Nice old-school feel right off the bat, and Lyell moves his burbling analog sounds around your head for full effect. From here, however, we simply glide into deeper realms and the aforementioned chimes take over. The two parts of “Dreaming in Sine Waves” are warm and blissful. There’s almost too much whooshing electronic wind happening on the first one, but it comes and goes, and in between I’m utterly charmed by the resonant tones of the chimes and the occasional spiraling electronic twist, so I let it go. The second is simply perfect, especially to an old analog lover like me. It’s a beautiful piece that’s comfortably familiar and nicely executed. A sequenced bass phrase repeats quietly beneath the chimes, and long pads draw out a song in slow motion. The title track is mesmerizing. It opens very quietly, its motion minimal at best, just a low-end pulse. Even the chimes here feel dialed back just a touch; everything rises and falls like it wants you to hear it but doesn’t want to intrude. It’s a very hushed and dreamy atmosphere that will absolutely bring you to a meditative state if you let it. This is a great showcase for Lyell’s subtle touch and his understanding of how potent quiet can be. You just want to remain still and watch it unfold in the air around you. Reflection of Time is a release that is bound to get a lot of looping play, and deservedly so. It’s one of those works that changes the space you’re in by its softness. Plus, again, if you love old school spacemusic, that deliciously angular construction that comes with knob twiddling and sequencing, you can’t help but love this release. Lyell is well-studied in the art, and he absolutely owns it here. Over the months that I’ve had this and the number of times I’ve gone through it, Reflection of Time has become a personal favorite. You need to hear this.